Holiday Camp is located at Pawna lake near Lonavala. It is around 45 km from Pune and 17 km from Lonavala. 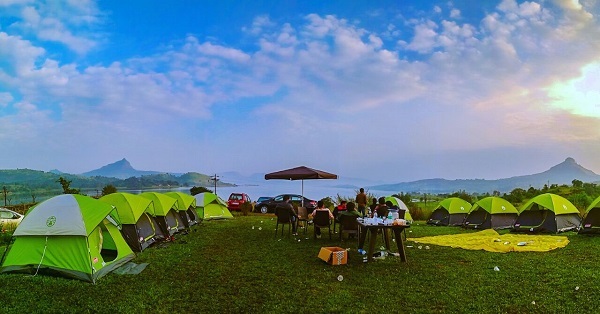 Holiday Camp is having excellent view of Tung fort, Tikona fort and Pawna lake. Lohgad and Visapur are also visible. Backside of the site covered with moutains of Mulshi dam. Holiday Camp is Spread over 5 acres of land. Have a fun with family and friends at Holiday Camp. More than 20 activities are available that you can enjoy at very nominal rate of Rs. 800/- per person. Holiday camp is offering excellent one day picnic package. Many corporate clients are visiting this place. 15. Outdoor activities like Football, Volleyball, Cricket etc. For booking please call Mrs. Sonali - 9552539132/ Mr. Amar- 8888811773. Sharing Video clip and images.